I spent the weekend in Lone Pine, a cowboy town on the far side of California. I'm not kidding about the cowboys; there were horses hanging outside the saloons on the main thoroughfare while their owners were inside getting beers. I was in Lone Pine for the hiking, specifically to climb Mount Whitney, the highest peak in the continental United States. And what a walk that was! What I wasn't banking on was that Lone Pine would be having its annual weekend-long film festival the weekend I was in town. I want to say a few words about the gem of an outdoor movie event I stumbled upon on Friday night after arriving, courtesy of The Echo Park Film Center. The Center, a non-profit media arts organization based in the Echo Park neighborhood of Los Angeles, visits the festival every year with its veggie-oil-powered "Filmmobile." Its representatives run filmmaking workshops for kids and adults and put on outdoor screenings. All of its activities at the festival are free to the public. 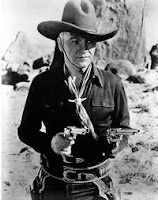 The night I was there, an old projector, which had been jerry-rigged to run on solar power, was playing the reels for a Hopalong Cassidy movie from the mid 1930s. Many classic westerns, including the Hopalong series, were shot in and around Lone Pine, so the film was the perfect choice. The atmosphere was lovely, with audience members sitting on benches under an awning in the warm evening air and helping themselves to drinks and snacks provided by the Echo Park Film Center. The organization's staff made us all feel very welcome. If I hadn't had to get up at 2 am on Sunday morning to hike up a big hill, I would definitely have returned on Saturday evening to experience the screening of Stagecoach.